It’s quite a way to elevate banter between rivals. Last weekend, the Seattle Sounders arrived at JELD-WEN Field to play their Cascadia rivals the Portland Timbers. The game itself finished in a 2-1 victory for the Timbers and a sending off for each team – fairly typical, robust, derby fare in other words. Atypically, the most memorable image of the day came before a ball had been kicked in anger, as the latest episode in an ongoing battle of creative oneupmanship took place in the stands. As the pre-match rituals took place, Timbers fans hoisted a 20,000 square foot, 1500lb banner that had taken the work of 66 riggers and which honored the club’s past with the phrase: “Legends are born when the previous are surpassed.” The giant tifo display showed the flags of Portland and Cascadia, flanking both the Portland skyline and an image of Clive Charles, the former West Ham and Timbers player who after his playing career went on to transform the University of Portland soccer program into a national powerhouse – shaping the early careers of the likes of Kasey Keller and Steve Cherundolo in the process. When he died in 2003, his shirt number 3 was retired by the club – and Sunday’s banner was a mark of respect from the fans for one of the most significant figures in Timbers folklore. Clive is in the Ring of Honor here – not so much for what he did on the field, though he had a good NASL career, but for his connection to the people here and what he did for the infrastructure of the game, not just in Oregon but nationally, with the young players he developed. We’re still looking for a player in the MLS era who can step up to have that sort of connection with the people here. This was our way of celebrating and inspiring. 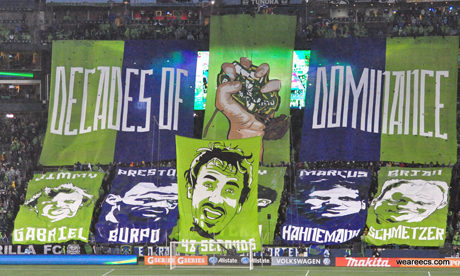 The tifo was also, however, the latest installment in what for the neutral is turning into a very entertaining rivalry between Portland and Seattle fans, conducted via the medium of these large scale displays. Seattle may not have been mentioned explicitly in the latest banner, but make no mistake about it, it was no coincidence that they were the guests at this latest unveiling and the “Legends” message was no accident either, as it has been a charged word in the exchanges between the rival fans. For the Sounders opening home game in MLS, the Emerald City Supporters start with a display that is modest by their own later standards, but that put down a marker for their arrival in the league. As the teams are announced, the fans hoist a large banner displaying the Space Needle and the phrase “Tonight our history becomes Legend” – as the former NASL team name is revived for the MLS era. With the Timbers still in Division 2 of the US soccer pyramid, they are drawn against Seattle in the Open Cup, and take the opportunity to offer a riposte to the Seattle iconography, with a display of their own long-time mascot, Timber Jim (predecessor to the current Timber Joey) chainsawing down the Space Needle. 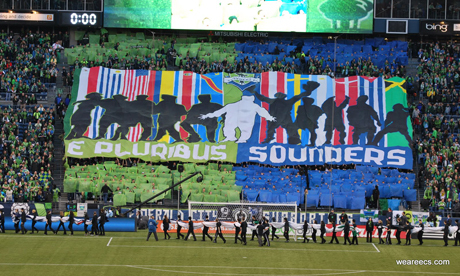 The Timbers arrive in MLS with what at the time was the largest tifo display to be seen in the league – an image celebrating the city and the fans with the phrase, “It takes an Army to Raise a Club” (the game is also notable for the national anthem being sung not by a guest singer, but by the entire Timbers Army). 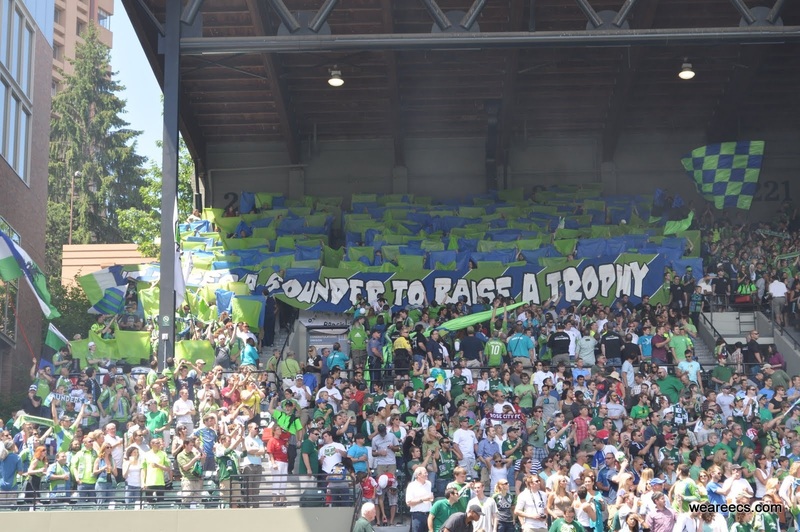 At an away game, Seattle fans later respond with a banner of their own, claiming that “It takes a Sounder to raise a trophy” – a nod to their contemporary Open Cup successes. Photo credit: Melissa Brassard / ECSAt the first MLS game between the two sides in Seattle, the Sounders went all out to try to intimidate their guests with a reminder of successes going back to NASL days. Images of club icons Jimmy Gabriel, Preston Burpo, Fredy Montero, Marcus Hahnemann and Brian Schmetzer were unfurled, before the message “Decades of Dominance” was dropped from the stands. Finally an image of Roger Levesque was raised as a final taunt – he had memorably scored against the Timbers after just 48 seconds…As displays went, it was a pretty robust response to the travelling Timbers Army, who, forewarned that a big display was on its way from their rivals, went for a certain ironic bathos. As Garret Dittfurth put it, “Our attitude was, we’ve been here and used to take this place over – who are you guys?” (a dig at the big increase in numbers of Sounders fans with the arrival of MLS soccer). Photo credit: Melissa Brassard / ECSOne claim the Timbers fans make is that there are two different philosophies at the two clubs when it comes to displays, and that generally the Sounders tifos tend to be more about attacking the team they’re playing, whiile the Timbers are more focused on celebrating the City (with Sounders games the “honorable” exception). Looking at the Sounders taunting of Open Cup opponents in particular, there’s something to that. But for their home opener this year, the Sounders chose to celebrate the multicultural origins of their team with no reference to their opponents, while on Sunday, as we saw, the Timbers went with their own celebration of their roots. So is the rivalry mellowing? Hardly – though both the Timbers and Sounders fan reps I spoke to admitted to a certain grudging respect for rivals who pushed them on to greater heights themselves. Both sets of fans also acknowledged influences from outside the US – the displays of the South Americans, East Europeans and of course the Italian tifosi who give their name to these displays. There are antecedents closer to home though – as Chicago Fire fans were quick to remind the Sounders when they visited in 2010. 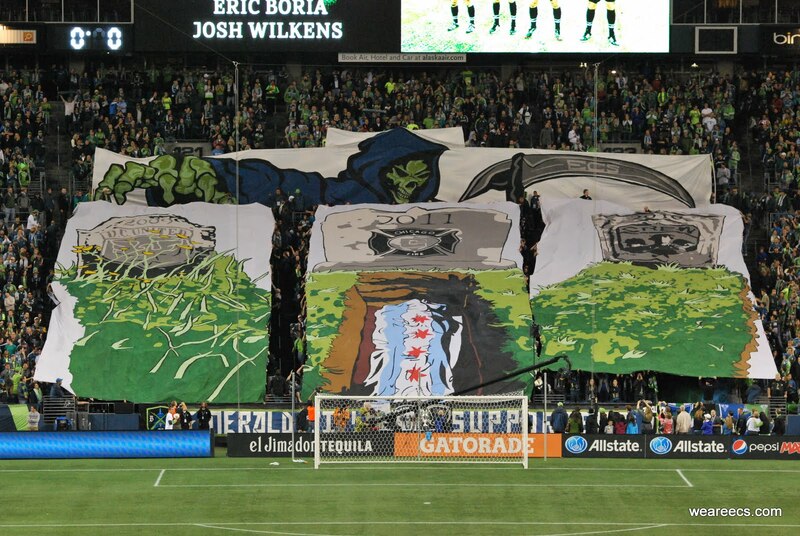 Chicago’s Section 8 were certainly at the forefront of importing tifo culture to the US. 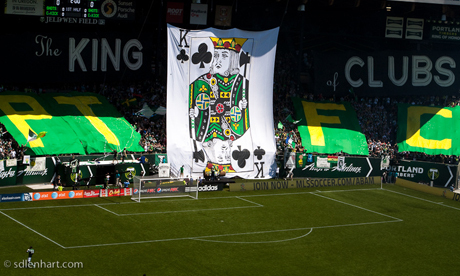 But as the latest banner was raised, and the latest visual gauntlet laid down, it was hard not to respect the sheer dedication and commitment the Timbers Army had put in to honoring one of their club legends this Sunday, whatever the origins of the art form in the US. Multiple hundreds of hours of labor go into producing an image that may appear only momentarily, but that has the potential to leave an indelible memory. Portland and Seattle play each other next in September, in the first network television MLS game on NBC. Be sure to tune in before kick off..